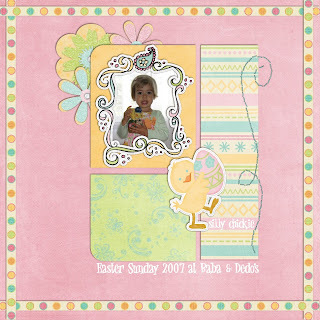 This was a quickie, I finally had a chance after the girls went to bed to look at the DigiChick challenges and found a LO in the scraplift challenge that would be great for the single Easter picture I got back in 2007 - the girls were not cooperative that year. I'm also using more of my goodies that I won with the April TDC challenge. The only 'nifty' thing I did was weave the ribbon around the edge, and that is just creative erasing. And another proud moment - it's all from the same kit!